When the Brazilian band Os Canibais went into the studio to record its second album, they left the Jovem Guarda (the country’s answer to Beatlemania) days behind and came out with a new name, Bango, and a new sound – that comprised psychedelia, hard rock, pop, soul and even Brazilian country music. Bango’s only LP was released in 1970 but besides being well recorded and having an inspired repertoire, had little success. After a few concerts, the group broke up and the record went into obscurity (later, some of the band members became notorious producers for Brazil’s biggest record companies). With the years, Bango self-titled album (the band’s name is an old slang for money but also a plant used to make hashish) became a legend in its own right and started to gather attention. The reason is obvious: songs like Inferno no mundo and Motor maravilha are killer tracks with amazing use of fuzz and wah-wah, gritty Hammond organ sounds, loud drums, catchy chorus and crazy moods that listeners will dive in even if they don’t understand the (Brazilian Portuguese) lyrics. And, of course, its beautiful monstrous cover art. On the other eight songs of the LP, the band goes from hard psych to soft ballads, from irreverent to phantasmagoric, from Heaven to Hell. 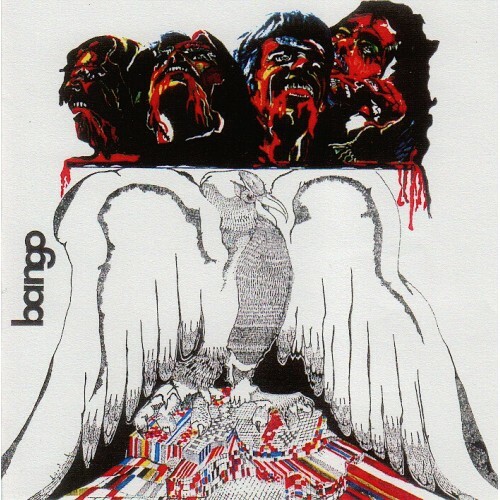 If you like bands like Os Mutantes and the lost Brazilian bands from the late 1960s/early 1970s like Spectrum, Liverpool and A Bolha, you will definitely dig Bango! This forgotten gem have been re-released once by a German label but was out of stock from years. Portugal’s Groovie Records is now putting Bango’s LP out with an exclusive and never before released bonus track, a cover of Elephant’s Memory Mongoose.